Rather then going to school to become a doctor or a lawyer, I chose to go to school and to study these two very things, culture and power. I spent my days studying how people have survived in various environments around the world and the role(s) that colonialism, power, race, and privilege have played in the oppression of people on all continents. One of my degrees is in Africana Studies (yes, that is spelled correctly). Africana Studies is a social field that allows people to examine history, anthropology, narrative, science, and various other fields from a non-western perspective. I think that by understanding that history is written by the victors is very limiting and that all people would benefit in their understanding of equity if they would go beyond trying to use limited understandings and narratives to comprehend the world around them. The world is so much bigger then a social studies book and multiple viewpoints do not always supply us with the narratives that we need if they are all coming from the same school of thought. Sapir and Whorf gave us an interesting theory in Anthropology. They said that a person’s worldview is determined by the language that they speak. This theory is known as, linguistic relativity. Since establishing this theory, many have poked holes in it, but certain elements remain clear to me such as cultural elements that have been introduced by privileged cultures to those that have become victimized due to colonialism. There are many cultures that do not have words for suicide, starvation, poverty, racism, etc. These are values that did not exist among their people or as norms in their cultures. Despite the non-existence of theses elements, they have become common place in less privileged communities. As an educator I do not want to create an environment where my students are hidden from the truth. I want to empower them with useful knowledge and not with fairy tales, heroes and holidays-so that the world is not so foreign to them when they are no longer within the safe confines of a classroom or a school. I know that youth are not absent to the presence of unfortunate happenings in their lives and communities-and that harsh realities are not reserved for mature adults. Many of the youth that we will be facilitating knowledge to have plenty of experiences that they can share with us and I plan to be open to that. 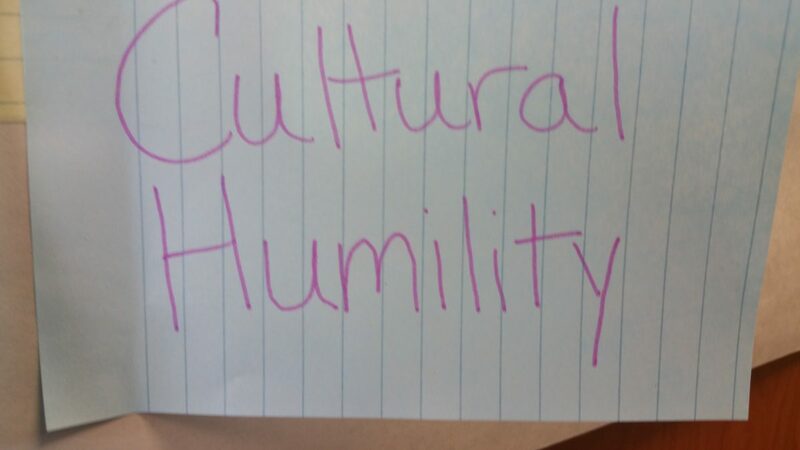 The three sets of words that I chose from our word wall are cultural humility, critical thinking, and privilege. I think that these three terms are beneficial when one is finding the need to engage in critical dialogues about race, multiculturalism, or even critical pedagogues involving breaking down dominant cultural barriers. I also think that these are important practices that one must participate in. While acknowledging ones privilege is the first step in bringing about equity, being humble and asking for a place at the table is the second step, not just taking up space in these dialogues. In order to teach in a culturally responsive way, I plan to utilize resources such as elders, artists, the SLAM, and the natural environment. I am going to call upon my students to become as familiar with the resources that are available to them as possible and to share that understanding with others. I am hoping to plan self directed learning units with my mentor/teacher so that my students can shine as independent learners and to be able to garner achievement that is truly their own. Ideas of ownership over knowledge content and community are important to people that have been historically disenfranchised. This may be a reality that holds true for the student population that I will be working with at Yaakoosge Daakahidi Alternative High School. Within the realm of social studies, students have an opportunity to learn about societies all around the world and how they might fit into them as youth and as adults. I want to take it a step further and help them understand that they have the power to shift social norms in their own quests for empowerment. You have a great opportunity at your placement this year to speak truth and empower your students! Thank you Tyler! I hope that is the outcome once I complete my placement. These last few weeks have me full of ideas.